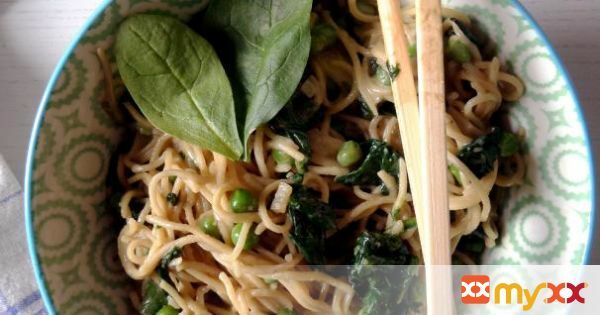 This recipe is simple, easy and delicious: noodles, spinach, peas, peanut butter, tahini… all good. 1. Defrost the peas. Wash and remove the stalks of the spinach. Chop roughly. Finely chop the ginger and the garlic. 2. Cook the noodles according to the packet's instructions. Drain and keep warm. 3. In the meantime heat the wok, then add the oil. Stir-fry the ginger and the garlic for about 30 seconds. Add 1 tablespoon soy sauce and about half of the milk. Add the peas and cook about 2 minutes. 4. Stir in the peanut butter, tahini, the remaining milk and soy sauce and simmer for 1 minute. Add more milk if the sauce is too thick or more peanut butter if the sauce is not thick enough. Adjust the taste with salt and pepper. Add the spinach and cook until wilted, about 2 minutes. 5. Add the noodles, stir gently to mix everything together and serve sprinkled with roasted peanuts.